At our firm, Thomas Barclay will take as much time as necessary to learn your goals and to tailor a legal strategy aimed at achieving them in a competent and cost-effective manner. 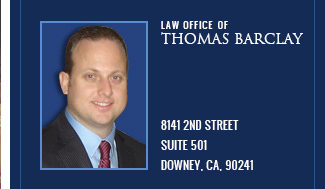 As the principal attorney at the firm, Mr. Barclay is committed to assisting you with your legal matters. We take our duty and responsibility to you seriously, whether your legal issue involves a business or personal issue.Our firm provides legal counsel for all types of matters, including business litigation , business disputes, breach of contract, business dissolutions, as well as real estate litigation involving both residential and commercial property. On the personal front, we handle legal matters involving a personal injury or elder abuse stemming from the negligence or misconduct of others. If you have a legal issue for which you need assistance which you don't see listed here, we can help you in finding the right legal counsel for your needs i n other areas of the law, such as family law, probate, estate planning, immigration, and more. We also provide Spanish-speaking legal services to our Hispanic clients. In today's tough economic climate, business owners often need solutions to the many distinct legal problems that immediately confront the business or that the business is concerned about more long term. Those problems can arise in day-to-day operations, as well as overall production, transactions, and planning. As a business owner or CEO , you may be facing any number of legal problems, based on government regulations and statutes, disputes with other businesses, customers, or employees, or with such matters as breach of contract, partnership conflicts, business torts, business organization or dissolution, real estate matters, and more. The size of your business or the community that it serves should not dictate the quality of legal services that you, as a business owner, deserve or can afford, especially during difficult economic times. Southern California has many law firms which cater to the business owner as well as to individuals facing personal legal situations. At the Law Offices of Thomas Y. Barclay, however, you will find a law firm that focuses on high-quality attention and legal remedies based on individual needs and goals that will protect you and your business now and into the future, regardless of your unique size or location. Centrally located between both Los Angeles County courts as well as Orange County courts, our firm serves business clients of every size and type throughout Southern California. Contact the Downey business litigation attorney at the firm for dedicated legal representation in any business law matter today.